Communities form around shared value and shared purpose: one without the other lacks momentum. With both, we can be productive, we can be unified. But that unity is not accidental: it comes about through processes of formation and guidance that we can influence and, indeed, need to understand and nurture if we want to utilise social ‘sense making‘ communities within organisations. We may have intent to grow a community, which gets us out of the gate, but we rapidly hit but the stages of ‘formation‘ and ‘direction‘. This is where we are rapidly iterating the roles and shape of the community, where we are establishing parameters of conversation and influence. The Social Age sees engagement in multiple and diverse communities: for change, for enlightenment, for support, challenge or editing. The precise shape of any new community starts with intent but is refined by early membership and the ways we reward that. We can view these early steps as ‘Consolidation‘, about putting momentum and energy behind the initial intent. Establishing early roles and building social authority within the group. We then move into a second stage: ‘Productivity‘. 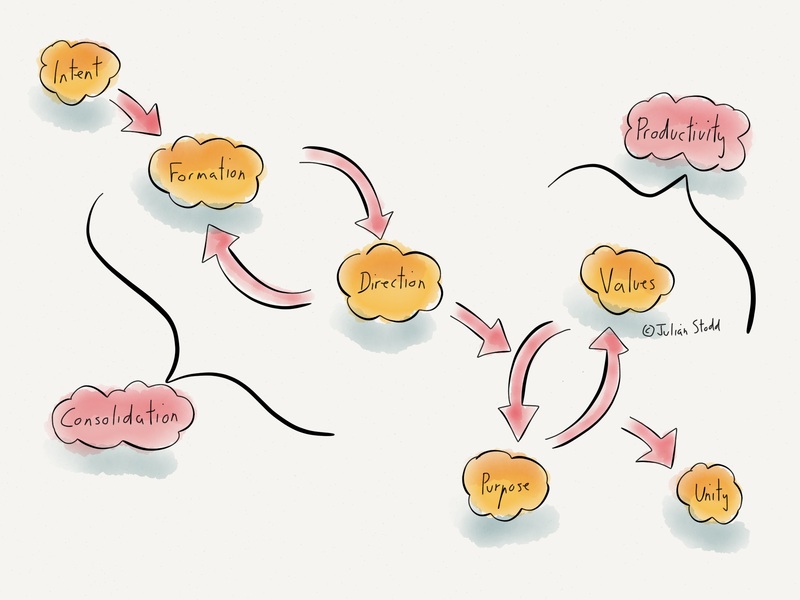 There is still a dance to be had, but it’s more about ‘values‘ and ‘purpose‘. If we are united around values, but have no clear purpose, we are on the sidelines. If we have purpose, but don’t share values, we are not unified. Many organisations have purpose but lack shared value, hence why they make poor decisions. Aligning both values and purpose, to be socially responsible and fair, to have intent and momentum, is what makes a community unified and effective. The journey to unity is not guaranteed: most social communities wither, especially when under the eye of the organisation. By paying attention at each stage of their development, we have a much greater chance of success. This entry was posted in Community and tagged Community, Consolidation, Intent, Learning, Purpose, Shared Value, Social Age, Values. Bookmark the permalink. 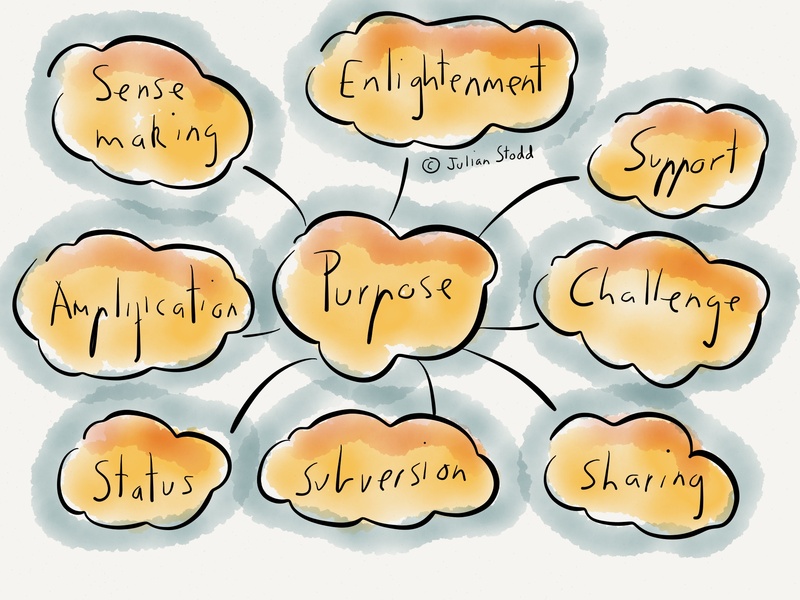 Rewritten from Intent to Purpose: stages of community https://julianstodd.wordpress.com/2015/02/02/from-intent-to-purpose-stages-of-community/ via @julianstodd (shared in http://www.facebook.com/mccsripetaling) Thank You.